Twenty-eight-year-old Sergei Berezutsky from Russia has been voted the best young chef in the world, according to the results of the San Pellegrino Cooking Cup international gastronomic race. The San Pellegrino Cooking Cup takes place every year in Venice with the support of the Compagnia della Vela yacht club. Over the course of two days, on June 13 and 14, chefs competed in gastronomic excellence, while yachtsmen raced to the finish line. The chefs’ dishes were evaluated according to their appearance, complexity of preparation, taste, and appropriate wine pairings. The winner of this year’s Acqua Panna competition and the San Pellegrino Young Chef of the Year 2014 Award was Sergei Berezutsky, from the restaurant As Eat Is in Moscow. He made mackerel with watermelon and crunchy beetroot risotto and Chechil cheese. “I brought the watermelon, beetroot, and Chechil cheese from Russia. The mackerel and risotto I picked up in Italy,” said the young Russian chef, whose dish combined Russian and Italian cuisines. For the second dish, he prepared a dish called “Two Paths”. This is langoustines with smoked bark artichokes, zucchini ravioli, and tomato consommé. Sergei served a cold tartar sauce on a natural birch stump. The judges sampled it and opened the lid of the stump to find a hot dish of the same ingredients, with artichoke leaves. The members of the jury were not disappointed. 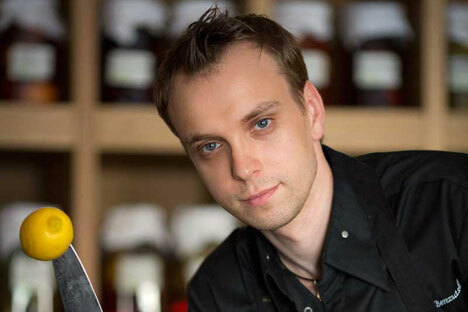 Sergei hopes that his victory will attract more attention from abroad to traditional Russian cuisine with a modern twist. The chefs’ artistry was evaluated by a jury made up of chefs whose own restaurants were listed in the World’s 50 Best Restaurants. Since Sergei Berezutsky was voted best chef, and the Russian team’s yacht crossed the finish line first this year, Russia took first place overall at the San Pellegrino Cooking Cup gastronomic race.